*Coat of faux snakeskin print. 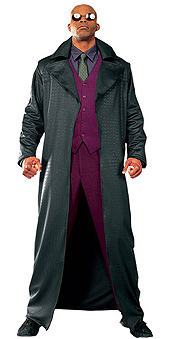 Protect the city from the machines and find The One in this smart Costume inspired by Morpheous from the Matrix 2 movie. With Morpheous' snakeskin suit and armless sunglasses you must be brave and save the day in this Matrix 2 Morpheous Costume.